You can learn a lot by playing in the dirt. You can learn about starting seeds, pulling weeds, the life cycle and the compost pile. Now that spring is in full swing, Tappan Middle School students are learning all that and more at the Tappan Garden. Tappan has had a garden for ten years now, said Lynda Norton, a parent volunteer. Students tend to the garden, coming with their science classes or opting to help out during their advisory period. Earlier this year, students picked what they wanted to grow. 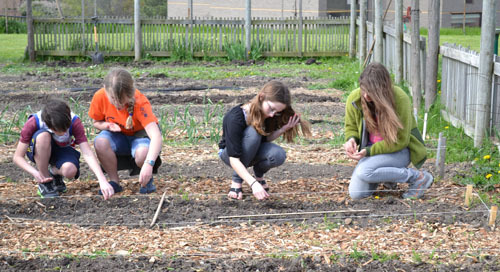 Last Friday, Susan Baker’s seventh grade life science class visited the garden. The students started broccoli seeds in the greenhouse, pulled weeds from a planned asparagus bed, and planted seeds that were ready to start life in the earth. Baker says tending to the garden reinforces this year’s lessons in nutrition, ecology and the life cycle. They also learn new lessons in the garden. 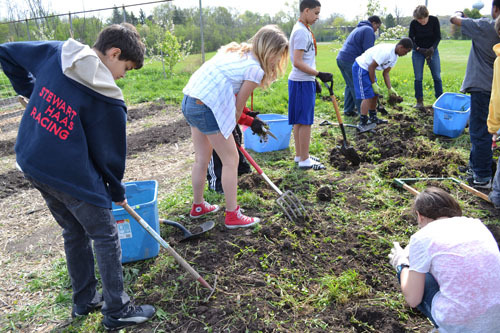 As a group of seventh graders hoed the dirt in the asparagus beds, parent and volunteer Kathy Sample explained–much to the students’ delight– just why the vegetable has the effect of turning urine green. She also talked about the history of the weed they were attacking. Called “Creeping Charlie,” it has bright green leaves and small purple flowers. As of the end of Friday, 1,680 seedlings had been planted, Norton said. This summer the parents will ask families to adopt the garden for a week at a time. “They would water and weed,” Norton said. “If there’s produce ready, they could take that home as well.” Excess produce is donated to Back Door Food Pantry. Agrarian Adventure provided most of the funding to build the garden, Norton said. The Tappan PTSO provides money for the operational costs, such as seeds and compost. Tappan isn’t the only Ann Arbor Public Schools building with a garden of its own, she added. Northside, Burns Park, King, Lawton and Bryant elementary schools have their own too. Pittsfield and Haisley elementary schools will start new gardens this spring. Check out the slideshow below for more photos from the Tappan Garden.